The officials of a leading world-class environmental utility firm, Visionscape today took the Cleaner Lagos Initiative (CLI) Sensitization and campaign to the popular Agbalata market in Badagry town. Cleaner Lagos, CLI is a new environmental cleanliness innovation initiated by Governor Akinwunmi Ambode, the Governor of Lagos State. Speaking at the campaign with scores of market women, men and their leaders present, Mr. Olumide Ilesanmi, the Badagry Area Manager of Visionscape took his time to educate the market men and women on the importance and health benefits of ensuring a clean environment at all time. Mr. Olamide urged his hosts to be grateful to God Almighty for the kind of Governor governing the state. He said Governor Ambode is a leader who knows the benefits of a clean environment and vowed to ensure Lagos is as cleaner than Dubai. He said the state government has invested hugely in the initiative, he then urged Lagosians to explore this rare initiative and ensure it's success. He, however encouraged the market users to ensure they reciprocate the laudable initiatives by ensuring total compliance and supports to ensuring the success of CLI in Badagry. Mr. Olumide, joined by Sanitation Supervisors further educated the market users on the proper usage of bin linners and the healthy way of disposing them. 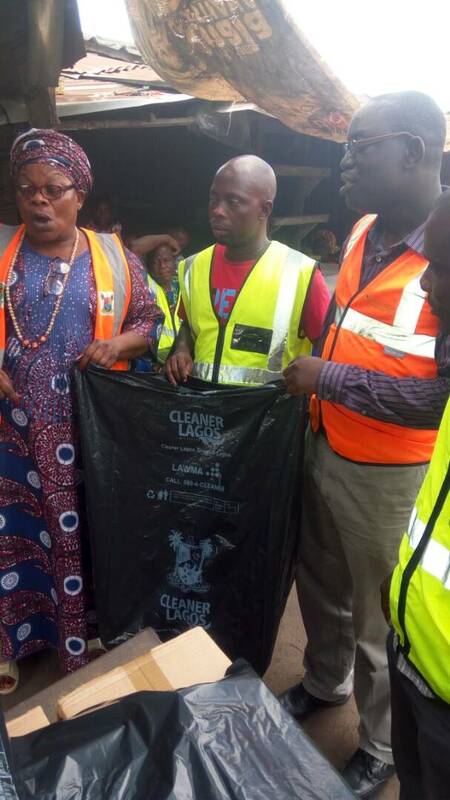 The Cleaner Lagos officials also distributed over 1000 bin liners to the market men and women. The Osi Iyaloja of Agbalata market, Chief Mrs. Okoya Oluwatoyin who spoke on behalf of the market leaders was full of praise to Governor Ambode and Visionscape for the environmental friendly initiative. She expressed the readiness of all market users at ensuring the sussess of CLI. She, however urged Visionscape and other government agencies involved in the initiative to ensure consistency and prompt carting away of waistes generated. The Osi Iyaloja also urged the Visionscape Officials to prioritized Agbalata market considering huge waste it generates everyday. The Cleaner Lagos officials had yesterday, 1st March, 2018 also held similar Sensitization campaign and distribution of bin linners at Ajara New Market. Other market leaders at the program are; the Babaloja of Agbalata market , Chief Akojenu Francis, the Otun Babaloja Chief Safudeen Tafa, the Market Master, Mr. Homakon Solomon among others. The other officials of CLI at the event are; Mr. kuyimo Moses, Mr. Seyide Hunpatin, Mr. Dansu Peter, Mr. Yonlonfun Whenayon, Mr. Hassan, among others.